Villa Red Land is situated in Divulje located between the popular Dalmatian destinations of Split and Trogir. The position of villa is perfect because it can be reached very easily by plane - the International airport is just a few minutes away. Alternatively, you can easily anchor a yacht in front of the villa and most of the middle Dalmatian islands such as Hvar, Brac and Vis are only an hour boat journey away. Whilst considering what qualities guests look for in a luxurious holiday home, the list of preferences is getting bigger by the second. We have the opportunity to offer you a brand new villa built in 2014, situated on a 3.400m2 plot that could offer you everything you've ever dreamed of! Easy to reach, either by plane, by car or by boat, a secluded beach oasis, where you will have your privacy, peace and quiet, yet be able to hop to one of your favourite Croatian cities in moments all in the walls of a stunning expression of architecture. 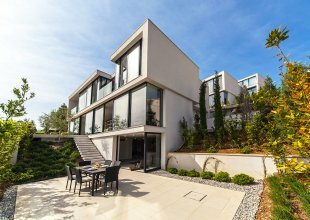 Within the villas large expanse of 360m2 interior space you will find comfort, elegance and warmth in this perfect holiday home. No expense has been spared with top quality furniture and attention to every single detail in design are two main features of this property. The essence was to make a visitor feel warm and welcome. The whole house is air conditioned and bathroom areas also have floor heating. The majority of the 3 metre high walls have window openings or sliding glass doors, so the inside areas are very lucent and bright. The interior has been decorated with special colourful details, adding an arty touch to the whole impression. There are LCD SAT TV's in living room and in every bedroom. The fully equipped kitchen includes dishwasher, stove, teppanyaki, oven, steam oven, wine bar, kitchen aid, coffee machine, refrigerator and freezer. An elegant open plan living area with kitchen, dining room and living room leading onto the outdoor patio with large swimming pool (100m2) and dining/seating/BBQ area around the swimming pool which is surrounded with palm trees and lavender, matching the colour of deck furniture. In the living room you can enjoy the flat TV screen with abundant choice of international channels and in the winter months you can warm yourself up by the vividly designed fireplace. The other parts of the ground floor area consist of one daily bathroom with Finnish sauna and one spacious bedroom with en suite bathroom and glass exit to a terrace, situated on the west side of the villa and a laundry room. The first floor is connected via the inner wooden staircase, where you will find master, VIP and guest bedrooms, all with en suite bathrooms and huge 2x2 metre double beds. Each room has its own particular contemporary style whilst maintaining ultimate comfort. All of the rooms have an exit either to a balcony, terrace or both. Master and VIP bedrooms have spacious glass openings to the south. By opening them you welcome the fresh sea air to your bedside with exceptional seaside views. Both rooms have bathtubs, while master bathroom also has a shower. Guests bedroom have a balcony overlooking the east side of the property, also catching the sea view. This bedroom has a special, cosy interior, created by using bright and white colours with warm wood details. The landscape around the villa has been designed as one elegant Mediterranean garden, filled with olive trees, lavender, rosemary, lemon and orange trees with palm trees surrounding the house.